Since then about 1000 miles have been put on the car, mostly around home. If fact, tonight we went out running in EV mode and when in sight of the house the mileage remaining dropped from 1 to 0 and a few hundred feet later the ICE started for the last few hundred feet until parked in the gargage. Before the PCM was reprogrammed it definitely would have been in the EV+ mode. Do I need to reset anything or does anyone have any other suggestions or similar observations to post? Most likely the last update reset your personal preferences, which includes EV+, back to factory spec. By default, it is off. Go into the settings menu on the left screen to find it. Lucille, I have a similar problem. I got the Energi in September and after a few weeks EV+ came on when the car got close to home. Lately, EV+ has not come on near home but it does come on when I get close to another location I frequent and that location has no charger. Doug, I checked settings and EV+ is on. Indeed the EV+ mode was back to the the default mode of "off", so I selected the "on" mode. Haven't driven it yet but I'm sure the problem is solved. You can go to the settings menu and reset the Lifetime Summary as described on pages 108 & 187 of the Owners Manual. This will clear ALL of the learned EV+ destinations previously learned, HOWEVER note the other items that will be cleared as described on page 108. Hopefully this will solve your situation. I haven't tried this in my NRG but I have in our CMax hybrid: You can force learn an EV+ location by power cycling the car on and off (foot on the brake) 11 times in a row while parked; takes less than a minute. The next time you arrive there you should see an EV+ indicator. IIRC, it will only store 5 locations. My vehicle learned my home (where I charge) in about a week of one or two trips a day. A second location that I drive to frequently, but never charge at took about 2 weeks to start showing up as EV+. Just went out and on return when near home EV+ mode switched on! EV+ mode save my bacon today. Went to the gas station (opposite direction) after work to get some................. ice. Anyways..... Leaving the store, I saw I was down to 1 mile EV with about 2 miles to get home. With 5 o'clock traffic, driving ulta-slow wasn't going to happen so I just kept the start/stops as smooth as possible and prayed for the EV+ to come on. I ended up traveling 1.8 miles. WHEW! BONUS: all this happened as I surpassed the 3,000 miles mark yet still on the dealers gas. Edited by fotomoto, 04 February 2014 - 03:43 PM. No need to buy ice. I would be happy to send you some of ours. We expect another "delivery" overnight. You would probably have made it anyway. The 3D battery means that you still had some EV capacity left. The distance estimate seems to read low as the battery nears empty and you are on the local streets near home because you are driving slower and it was based on your entire trip (possibly lower MPG highway miles). The miles displayed represents the integer of the actual miles predicted. Thus 1 mile displayed might be 1.95 miles and 0 might be close to 1 mile. And then comes the EV+ as the icing on the cake to give you another 1/2 mile or so after the EV portion of the battery is used up if you are lucky because it expects to be plugged in when you get home (or ar least that the ICE will need to run anyway to warm up when the car restarts if it doesn't get a charge). This is best example where the EV+ is useful. Most other times it is good for conversation but not much more because the car will typically run the ICE in anticipation of EV+ shortly before you get into range if the ICE is enabled. Also, when was your NRG built? I thought they got rid of MPGe with Job 3. ICEing is not allowed on this site! It is considered impolite. So what happens if you get close to your house and it shows EV+ and you never go home, you keep driving around your house will it continue to use battery from the Hybrid portion of the battery until it runs out? Would you be able to get more range from your total EV miles during that charge? Just curious because I see some people talking about how they got 33.9 mi on 1 charge by supercharging (cooling the cabin to 73° while running the car and plugged in. 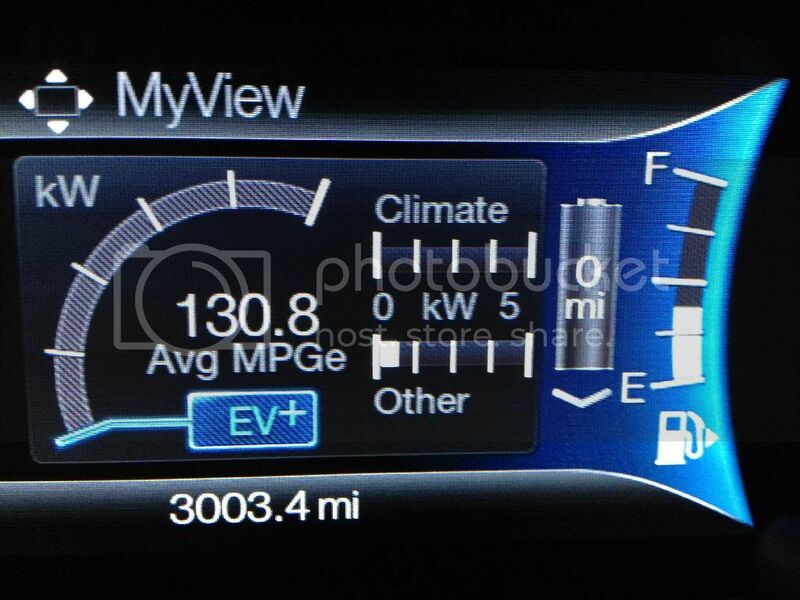 Anyways just wondering if the EV+ is actually how they got 33.9 mi on their display. EV+ gives you 2 bars of power allowance on the hybrid battery even though the hybrid battery is dying. It will maintain 2 bars until the voltage drops too low, and then suddenly the 2 bars will drop to 1 bar or less if you keep driving in EV+ around the house. If you pass the house and drive away, eventually EV+ will go out on its own. The whole idea of EV plus is to give you 2 bars so you have less of a chance of starting the engine when the battery is dying. Its not intended to give you more out of the battery, and it really doesn't, just gives you a higher threshold as long as it can if that makes sense. Edited by rbort, 22 August 2015 - 05:29 PM. before it switched over to hybrid mode. It all depends on how well you use the available EV power stored. I understand the concept of the EV+ but I am not sure I would like to use it. While I haven't checked the state of charge (SOC) when it would go into EV+ mode, my concern would be running the battery into an even deeper cycle thus limiting its lifespan. On my NRG, when the car's energy display on the charging screen shows 0%, the actual SOC according to Torque is about 17%. The closer you get to a full discharge (where actual battery charge is at or almost 0%), the less charge cycles you get from the battery. Has anyone measure how low EV+ will actually let the battery pack get? I once got the Hybrid battery mostly depleted in EV+ mode and the SOC per a ScanGauge indicated 14.5%. This took a bit of effort. Normally it does not get much below 16%. The HVB Average Cell voltage usually gets no lower that 3.5V. I think the lowest average cell voltage I have ever seen was 3.36V but that does not occur often. I have also monitored the minimum cell voltage and it always matches the average cell voltage. I don't see any reason not to use EV+. I checked the 2013 manual and it looks like EV+ can be shut off in the driver assist section of the settings menu. EV+ is intended for the last 1/3 of a mile or so home (or a frequent destination like work) and gives you 2 bars limit even though the bar limit is lower at the time. You won't empty the battery any more than 14.5%, if you use that 2 bar limit and the battery drops close to 14.5%, suddenly the 2 bars are taken away and you end up with 1/2 bar or whatever is left at that time. I've been there and done that. The difference is that in EV plus if you need to climb a shallow hill to get home you can easier with a 2 bar limit than with less than that.